Inscrutable symbols etched on a limestone boulder in western Nevada — herringbone patterns, series of pits, and chain-like links — are the oldest known petroglyphs in North America, scientists say. And they may be the oldest evidence of humanity on the continent. 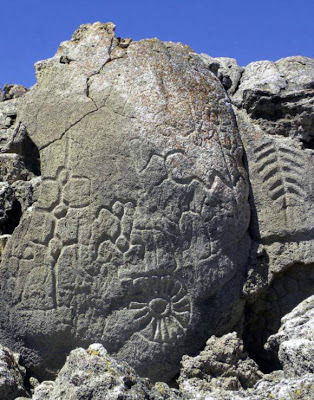 The rock art, perched along the shore of now-dry Lake Winnemucca some 55 kilometers northeast of Reno, had been discovered decades ago. But a new study, published in the Journal of Archaeological Science, reports that tests of residues found both on top of and underneath the glyphs dates them to at least 10,500 years ago — and perhaps has much as 14,800 years ago. The research, led by L.V. Benson of the U.S. Geological Survey and Boulder’s Natural History Museum, analyzed the artwork’s thin but telltale film of carbonate — a compound that precipitates, or forms as a solid, when water and carbon dioxide react with the calcium carbonate in limestone. Where carbonate has formed, the limestone rocks must have been under water. Radiocarbon dating of the lower layer of carbonate, under the carvings, showed that it formed about 14,800 years ago. The layer above them, meanwhile, dated to 10,500 years ago. So, the team argues, the petroglyphs sandwiched between the two strata must have been made within that time frame. Those dates were further confirmed by carbon dating sediments found at the same elevation as the petroglyph site — about 1,205 meters — from around Lake Winnemucca and neighboring, and still wet, Pyramid Lake. Those results showed that, indeed, the waters of the prehistoric lake had receded temporarily for two extended spells — from 14,800 to 13,200 years ago, and again from 11,300 to 10,500 years ago — indicating when the boulders were above the water line to serve as canvases for some ancient artists. “Prior to our study, archaeologists had suggested that these petroglyphs were extremely old,” Benson said in a press statement. In fact, archaeological evidence found around the ancient West can be used to make a case for either date. Until this new study, the oldest known petroglyphs on the continent were found along central Oregon’s Long Lake. Benson points out that the Winnemucca rock art bears a lot of stylistic similarity to those glyphs. But all that’s known about the age of the Oregon images is that they were carved some time before 6,700 years ago, when they were covered by a thick layer of volcanic ash. It’s conceivable, they posit, that the Nevada carvers were contemporaries of the artists in Oregon. Human feces found in Oregon’s Paisley Cave, after all, have famously been dated to 14,400 years ago — making it possibly one of the oldest known sites of human habitation in North America, though some experts consider this a controversial prospect. In support of the earlier date, however, is Spirit Cave just a few kilometers away from Lake Winnemucca. There in 1940, a naturally mummified man was found buried in a fur robe and dated to 10,600 years ago. Could his culture have been the one that left its mark at the ancient lakeshore? The only other site that threatens to outclass all of these in age in Pennsylvania’s Meadowcroft Rockshelter, where artifacts have — again, somewhat controversially — been dated from 16,000 to 19,000 years ago. I was given some pieces of carbon from Nevada. Supposedly dating back 265 mil years ago. You can see small shell markings in them. How do I research if this is true?